One more healthy, instant, gluten-free, no need to wait till rising the dough or fermentation of batter, no need to knead the dough, no yeast, no need of oven to bake. Drooling? Yeah! 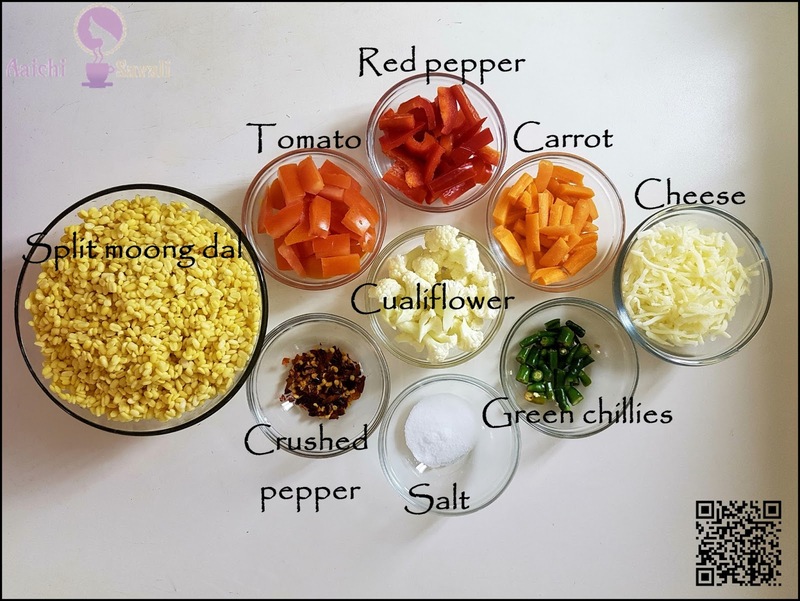 I know it's healthiest, easiest, quickest, way to prepare this Indian style homemade moong Dal veggie pizza. The moong dal pizza or moonglet is turned into a fluffy waffle-like, which is topped with a mix of veggies and cheese and served with delicious homemade tamarind / green chutney or tomato sauce. So winter has set in, and it is the time of the year when our body experiences lots of changes in metabolism, energy levels and our food choices also change. In this cold season, our body needs extra vitamins and minerals to help combat cold weather, illness and to maintain your good health. 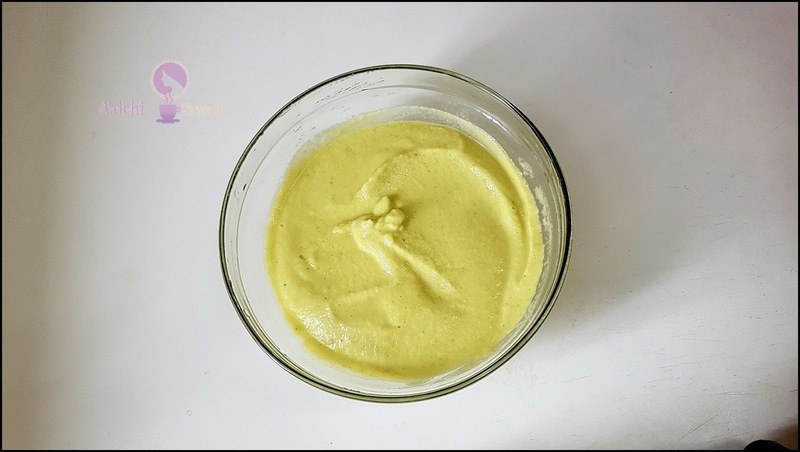 So here is one of the healthiest recipes which will help to boost immunity and maintain the energy levels throughout the day. The fluffiness and soft texture inside with a perfect crispiness from outside is a simple yet impressive recipe. We certainly can’t keep our hands away from this Made in India Pizza. This moong dal pizza has no relation with Italian style pizza; still considered as a pizza due to its shape and texture obviously. From kids to older once will love this pizza. The thing that makes this pizza so unique is that the crust is made out of moong dal - yes the lentil! The edges of the crust even get crunchy as regular pizza does. So, yep pizza can be Healthy! There's no need to feel guilty about eating a few slices of pizza, as each piece of pizza (with toppings) has only 90 cal, 11 g carbs, and 5 g protein! It's already a gluten free version and to make a vegan version just replace cheese by adding olive oil or veg oil, and you will get your vegan pizza. Each Moong Dal Pizza Contains 545 Cal. water for 2 hours,meanwhile, chop all veggies (for topping pizza). 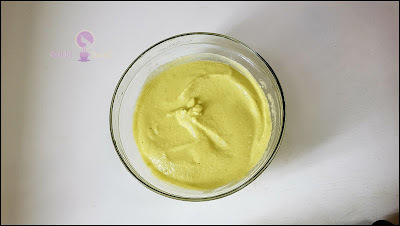 After 2 hours, in a grinder add soaked moong dal, green chillies and salt, grind to make paste. Place grinded dal into bowl (add water if needed), add baking soda and mix well. 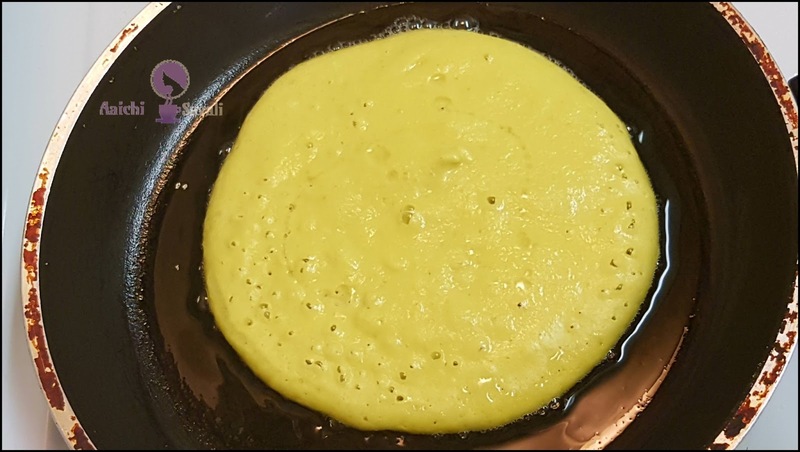 a pan, heat it, add oil in a pan and add the batter and cook on medium to low flame (keep it thick as shown in video). 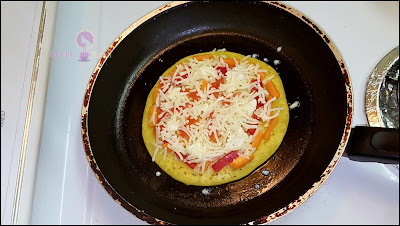 Place cheese, chopped veggies over pizza. Drizzle some oil over it, cover and cook it on medium to low flame for 2 to 3 minutes or till cook well from beneath. Now, flip pizza, cover and cook for another 3 to 4 minutes. After well roasted from both the sides, take pizza out and place it in a serving plate. Sprinkle some red chilli flakes over pizza and cut into desired shape. ready to serve, serve hot with tomato sauce, any chutney. Enjoy!!! If you like you can pour pizza sauce too, before adding veggies. To make vegan version just add olive oil, instead of cheese. You can add toppings of your choice, such as, paneer, tofu, onion, olives, green peas, corn, and much more. 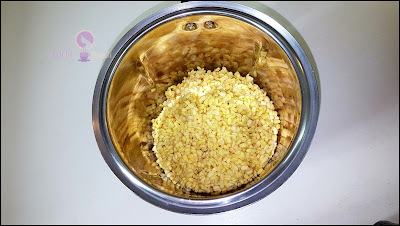 Also while grinding moong dal, you can add ginger and garlic too. 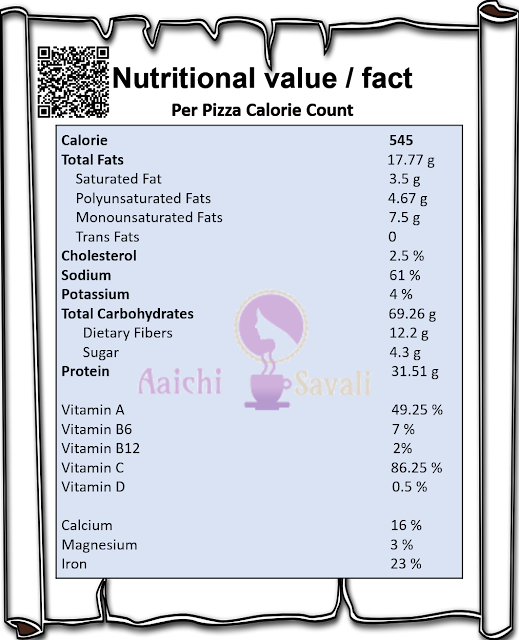 Per serving contains 545 calories, along with carbohydrates - 69.26 g, dietary fibers - 12.2 g, fats - 17.77 g, proteins - 31.51 g.
One of the best health benefit of eating Moong Dal Pizza for any meal is, it has high fiber content, while fiber provides a lots of health benefits, such as it helps to lower cholesterol levels and stabilizes blood sugars as well as keeps you full for longer, so it's good to eat this moong dal pizza for weight watchers too. Digestion : High fiber content helps to promote regular bowel movements and helps to digestion of food too. It's also high on carb, vitamins, protein and which provides lots of energy. Brain : it helps to improve concentration, balance, it also helps in providing regular glucose supply to the brain, as brain can't store energy for later use like other organs, it needs continuously supply from glucose. 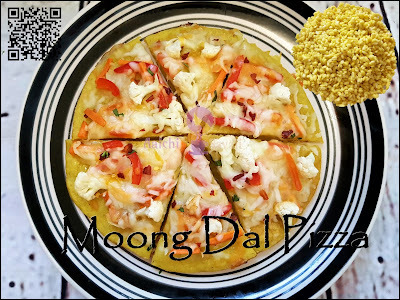 It's good to eat moong dal pizza for breakfast, lunch as well as for evening snacks. Thank you. Yes we can say it as moongdosa, Moonglet, moong chilla pizza. It is Indian version of pizza.